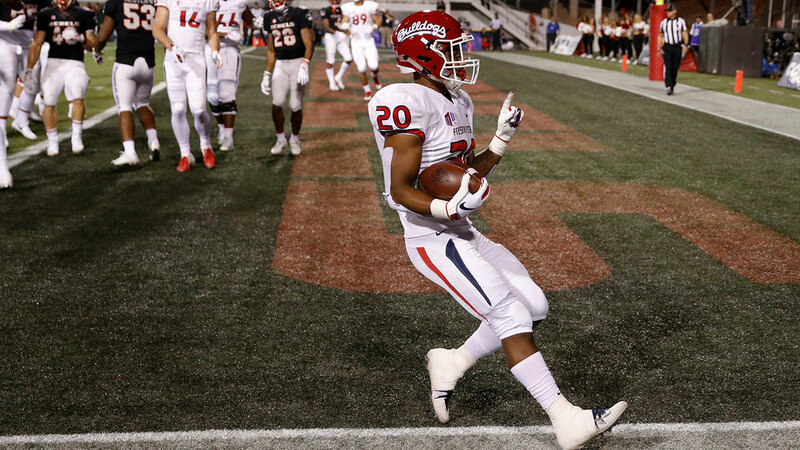 FRESNO, Calif. (KFSN) -- The Fresno State (8-1, MW 5-0) football team beat UNLV 48-3 to stay perfect in Mountain West play. It was the 100th win of Jeff Tedford's coaching career (82 at Cal, 18 with FS). Jamire Jordan capped the Bulldogs opening drive with a 12-yard touchdown catch. Senior quarterback Marcus McMaryion (Dinuba grad) had an efficient night leading the offense throwing for 26/35 278 yards and two touchdowns. The matchup with the Rebels was the first game FS has played ranked all season coming in #23 in the first College Football Playoff rankings and #20 in the AP Poll. The Bulldogs are expected to move up after losses from #20 Texas A&M, #17 Texas, #16 Iowa and #15 Utah. Next Friday the Bulldogs travel to face Boise State (7-2, MW 4-1) for the first time since falling to the Broncos 17-14 in the Mountain West Championship game. #20 @FresnoStateFB beats UNLV 48-3 to improve to 8-1 on the year and a perfect 5-0 in @MWconference play.